Asus has announced refreshed VivoBook S15 (S530) and S14 (S430) which runs Windows 10. These stylish and lightweight laptops come in five different and eclectic colors. With a three-sided NanoEdge display, users also enjoy an immersive viewing experience. These are powered by up to an 8th Generation Intel Core i7 processor, with NVIDIA GeForce MX150 discrete graphics. 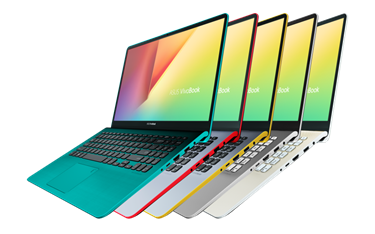 The VivoBook S15 and S14 come in an eclectic mix of colors, namely Firmament Green, Star Grey, Silver Blue, Gun Metal, and Icicle Gold. Furthermore, while Firmament Green features a textured woven finish surrounding the keyboard, Icicle Gold sports a brushed finish with diamond-inspired motifs. For comfortable typing, these laptops come with the innovative ErgoLift hinge which automatically tilts keyboard by 3.5° and recreates the familiar feeling of a desktop computer. The hinge also provides extra ventilation space, enabling more airflow around the underside of the chassis for improved cooling. VivoBook S15 having a display of 15.6 inch and S14 with display of 14 inch are the first in the VivoBook Series to feature the new three-sided NanoEdge design that has even narrower bezels along the top and sides of the display. This gives S15 an 86% and S14 an 84% screen-to-body ratio, offering an unrivaled immersive experience in a compact package. These are lighweight devices having weight of 1.4KG (S14) and 1.8KG(S15), respectively. These laptops are powered by up to 8th Generation Intel Core i7 processors and NVIDIA GeForce MX150 discrete graphics. The S15 and S14 has a dual-storage design. Furthermore, ASUS Wi-FI Master technology ensures uncompromising wireless connectivity, ensuring faster and more reliable dual-band 802.11ac Wi-Fi connections at extreme distances. For security, these laptops provide one-touch access with Windows Hello, via an optional fingerprint sensor built into the touchpad. The full-sized VivoBook S15 keyboard is perfect for dim environments, ergonomically designed with a sturdy one-piece construction and 1.4mm key travel for a comfortable typing experience. The S15 and S14 have the reversible USB Type-C port with the any-way-up design. USB-C 3.1 Gen 1 delivers data transfer speeds that are up to 10X faster than older USB 2.0 connections. In addition, these laptops also feature USB 3.1 Gen 1 Type-A and USB 2.0 ports, HDMI output, and a microSD card reader for hassle-free compatibility with current peripherals, displays, and projectors. These laptops are equipped with a high-quality battery with all-day battery life with fast-charge technology which ensures up to 60% charge in 49 minutes. The S14 starts from Rs. 54,990 and will be available from November 1st on Flipkart exclusively. The S15 starts from Rs. 69,990 and will be available in all Asus exclusive stores from November 15th.